August 31: What's Jen Clicking on Between Newscasts? 11:15 Monday: it's only a "matter of time" before fire hits Mount Wilson. All those towers on Mount Wilson ... the peak behind Pasadena, if you're looking from downtown LA-ish (still not sure? click here) are critical to broadcasters, but the Wilson Observatory is a complex of buildings that invokes names such as Hubble (the telescope guy,) Hale (the Hale-Bop comet guy) and McAlister. Mount Wilson Observatory is now at risk. The situation is very unstable with sudden changes. The fire is spreading eastward and may reach the radio/TV transmitters and then the Observatory on Monday. 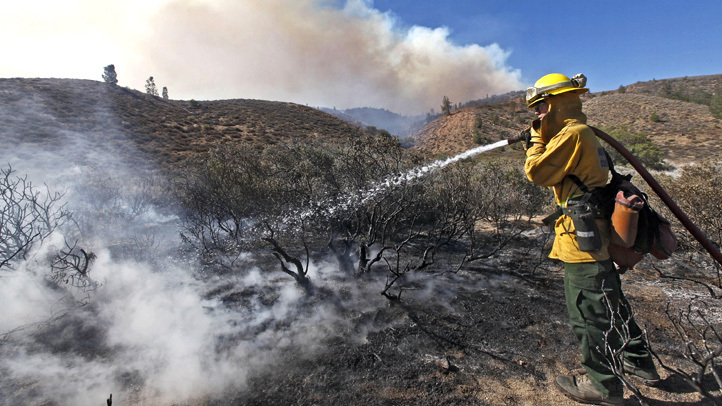 Firefighters have been making a major effort to defend Mount Wilson. As a precautionary safety measure, all Observatory personnel and visitors have been evacuated. Parts of Angeles Crest Highway and Angeles Forest Highway (and some other roads) will likely remain closed for a week or more, depending on the course of the fire and efforts to contain it. Some of these roads are essentially impassable. Currently there is no public access to the Observatory from any route; La Canada, Palmdale, or Wrightwood. Some mandatory evacuations in La Canada, La Crescenta, and Altadena have been ordered. The main campus of JPL has been shut down. Mount Wilson Observatory is closed and shut down. All Observatory activities have been stopped. The stuff they have up at Mount Wilson Observatory isn't something you can just throw in the car and evacuate when a fire starts rolling your way. The road is treacherous, for one, and the telescopes and equipment up there, gigantic. Check out this picture to the left of the mirror for the 100-inch telescope making its way up the mountain in 1917. It's the telescope Edwin Hubble did the calculations on to determine the universe is perpetually expanding. Groundbreaking science, right there on a mountaintop in our own back yard. It was a glass disk 7½ inches (191 mm) thick and weighing 1900 pounds (860 kg). However it was not until 1904 that Hale received funding from the Carnegie Institution to build an observatory. Grinding began in 1905 and took two years. The mounting and structure for the telescope was built in San Francisco and barely survived the 1906 earthquake. Transporting the pieces to the top of Mount Wilson was an enormous task, and a mule train was built to carry the material up. "First light" was December 8, 1908. It was at the time the largest operational telescope in the world. The 60 inch (1.5 m) reflector became one of the most productive and successful telescopes in astronomical history. "A lot of people think of an observatory as one dome, but Mt. Wilson Observatory is actually a 40-acre tract of land with 50 to 60 buildings on it," McAlister said. "None of that stuff is portable, and to move telescopes out of there takes many weeks. We're strictly at the mercy of nature and the great competence of the firefighters." When we finally got up to the Mt. Wilson turnoff, we managed to drive another two miles up toward the TV towers and the observatory. Then we saw fire on both sides of the road and large boulders blocking our way. We turned around and went back down the hill. No point in getting killed over this story. A wire service reporter tried to drive past the rock slides. He ended up ripping open the oil pan underneath his car. At 6:15 this morning, the Forest Service pulled all of its crews off Mt. Wilson. A fire supervisor told me it just wasn't safe to leave anyone up there with the flames approaching. The radio and TV stations that have Wilson relay points (ourselves at KNBC included) can rebuild the towers, but the stuff up at Mount Wilson Observatory is unique. Monday, 31 Aug 09, 7:50 am PDT - At 6:25 this morning, fire crews were instructed to withdraw from Mount Wilson. Larry Webster and Dave Jurasevich left the mountain with them. I have just spoken with Larry and Dave when they reached the bottom of the Angeles Crest Hwy in La Canada, and they report minimal fire activity in the immediate vicinity of Mount Wilson. It is not clear why the withdrawal decision was made nor whether or not the fire crews will return. Those fire fighters joined other crews deployed at the Red Box turnoff to Mount Wilson, five miles from the Observatory. So, they are still within close proximity for redeployment. Thus, the good news is that the fire in the Observatory's vicinity seems to have diminished. The bad news is that there are no fire fighters presently on the scene. Mount Wilson Observatory has a history that's kind of hard to fathom too, to go along with the impressive array of telescopes. Sure, the Griffith Observatory is the pretty one, the one everyone sees from Hollywood and gets to visit with an easy hike. But Wilson is different. Back in the day, one of the first people to make the treacherous trip up the mountain road by car in 1907 said he wouldn't do it again, not for "$500." A load of cash back then, for sure. It's remote, it's discreet, and it's very serious. Take, for example, this picture. Click on it for the Berkely Science website it came from. ...On a visit to the Mount Wilson Observatory near Pasadena in 1931, Albert Einstein demonstrated his calculation of the density of the Milky Way. By using Mount Wilson's 100-inch telescope Edwin Hubble had recently shown that the universe is expanding. 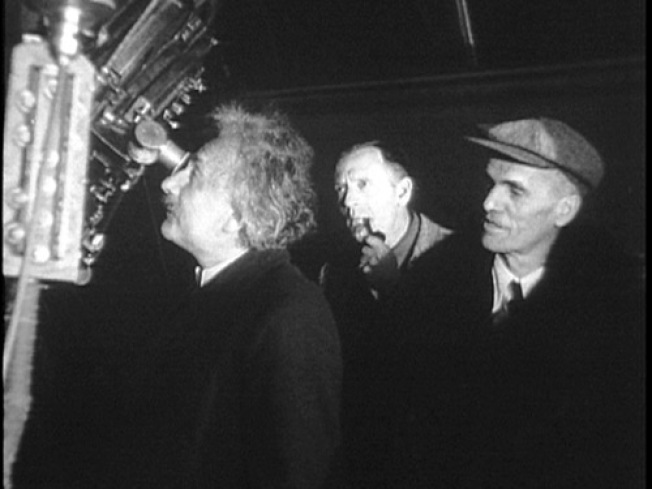 ...German astronomer Walter Baade was working at Mount Wilson Observatory in the 1930s with Fritz Zwicky when he first used the term supernova (SN) to describe the brightest of exploding stars. Baade proposed that supernovae (SNe) could be used as astronomical standard candles to make measurements at greater distances and higher redshifts than were possible with standard candles like Cepheid variables — far enough away to allow the study of changes in the rate at which the universe was expanding. Today, the fire threatening the observatory is expanding at a rate that's hard to imagine. Overnight, it doubled in size from 45,000 to 85,000 acres. That's nearly 150 square miles, and it's active on three flanks. If the wind shifts, the observatory could become a casualty of the same mother nature it has examined, now, for more than a century.